Excelsior SO2 emissions awfully high! What important is that the emissions predicted for Excelsior Energy’s Mesaba Project are significantly higher than the others, SIGNIFICANTLY HIGHER. When Alan Muller had questioned the Excelsior witnesses at the hearing, they’d said that a more effective means was “too expensive.” From the charts in Jenkins’ powerpoint, it seems something to pay attention to! As you readers know, I’ve been frustrated by enviro IGCC impotence, as have my clients, who just don’t understand why “enviromental” groups won’t talk to them. I’ve had several discussions with some individuals in Sierra around the country where they’re inexplicably supporting IGCC. But for the record, I want to thank the Minnesota North Star Chapter for its willingness to address IGCC, though not as an Intervenor in the Mesaba Project, as a Commentor in the docket — their politics are in the right place, and they’ve done good. Their participation has been greatly appreciated. It’s been helpful when the other “environmental” groups have their “hands tied” and their heads firmly implanted. So I’m sorry to see Sierra in such disarray and it sounds to me like national leadership has their priorities screwed up. The Clorox deal, blasting Florida, whatever are they thinking. The National Sierra Club Board of Directors made an unprecedented and unfortunate decision, as predicted, to “suspend” our Florida Chapter for four years, finalized March 25 on a 10-2 vote (Jim Dougherty and Bernie Zaleha). Consequently, our Flexcom, our committees, and state-wide and regional entities are now suspended. Today national has also shut down these list serves: FL-CONSERVATION-FORUM, FL-SPRAWL, FL-COASTAL, FL-GLADES-COMM, FL-LEADERS, FL-MEMBERS, and will likely shut down all of the chapter list serves. We expect that National will also take the Florida Chapter pages off the National Sierra Club website soon. The consequences of their ill-advised, anti-democratic action we fear will be disastrous for the environment, even as our local Sierra groups around the state attempt to continue in their present make-up. Local groups can look to National staff and a National-appointed steering committee for direction. As over a hundred of us warned, Sierra’s name and impact will be undermined now, possibly for years, since powerful public relations firms for the developers and their governmental and otherwise compromised environmental group apologists will doubtless take full advantage of the situation. Your specific role as a volunteer for one or more of our forty-some Chapter committees has been suspended, though some may be approached by the new national-imposed steering committee. We will all have to make our own decisions as to what roles we take on now with our continuing environmental activism. We acknowledge and are thankful that many of us were introduced through the years through the Sierra Club. Urgent Alerts and announcements of important upcoming meetings will surely still be shared among us. We are compiling our “lessons learned” from this last year of misery at the hands of the National Club. The implementation of Project Renewal, passed in last month’s Board of Directors meeting in Atlanta, has already replaced dozens of national activist committees, comprised of longtime, dedicated volunteers. National’s Energy Policy is still encouraging the unwise development of biofuels in a state whose water resources and agricultural soils are already overused and in danger of imminent exhaustion. Nationally, other enlightened groups are realizing the folly of many of these biofuels proposals consume more energy than they produce. Someday, Sierra will stop embarrassing its members and will have to admit that both the technology and the economics of biofuels are wrong. They may not admit that the Florida Chapter was right, but we will still know. Meanwhile, where do the new major funding sources for Sierra’s promotion of biofuels really come from? Inquiring minds want to know, of course, and the truth will eventually be revealed. We are so sorry to have to be telling you this. Please be aware of the club’s rules on affirmative standards of conduct– no personal criticism / attacks, especially in the press; and be very discreet before sharing internal documents outside the Club; to be safe, assume all internal documents are confidential and refer reporters to national’s public relations office. we have repeatedly asked in vain (or attempted to provide funding ourselves) for important conservation campaigns (-snip-)anti-sprawl campaigns, and against the behemoth St Joe Corporation in the Panhandle, and anti-coal plant campaigns and other energy work by our local and chapter activists. But it is also true that Florida was the most enthusiastic chapter to support and attend the first ever Sierra Summit in California with more official attendees than any other chapter! We also participated at national’s behest in the NPLA Harvard Surveys; and were among the first to volunteer to be a pilot chapter to dedicate four weekends to national’s new Leadership Development Project. When national reorganized conservation priorities to the three Conservation Initiatives Committees, Florida was the first chapter to reorganize our conservation issue committees under a parallel structure, showing our team work with national conservation leaders. All this has not kept us from the unprecedented national scrutiny which exaggerated our every internal disagreement over the last two years. (-snip-) The decision-making votes by our hard-working FLEXCOM (were analyzed) and found that 95% of over 220 motions voted on in 2006-2007 were decided by at least a 2:1 margin, And in over four-fifths of the decisions, agreement was overwhelming, with 90% or more voters agreeing. In approximately two thirds of the decisions, agreement was unanimous. We sincerely want to thank you for helping us build one of the strongest, volunteer-led Chapters in the country, and we hope that you will continue to channel your energy and time into local environmental work. Stay in touch! There is so much more to do and your work is really appreciated by environmentalists and our supporters in communities who have wisely avoided internal bureaucracy, complaint departments, and special problem-eliciting websites, etc… See you at the next demonstration, picket line or government public hearing! As many of you know, the City has entered into a conditioned Purchase Agreement with Midtown Eco Energy LLC (the developer) for the sale of 2850 20th Ave South. The sale was predicated on the site being developed for a biomass combined heat and power generation facility. As required by the purchase agreement, the developer would need to meet certain requirements (at specified dates) in order for the sale process to continue towards closing. The developer has submitted documents and a required payment in with the intent of “exercising their option” to purchase the property. The purchase agreement required that the developer initiate this process and meet the “Option Requirements” of the purchase agreement by March 30, 2008. A staff team comprised of Steve Kotke, Pat Born and Shelley Roe has reviewed the documentation submitted by Midtown Eco Energy, LLC. 4.2.1 pay to Seller (the City) the entire Option Price ($50,000) ……. The Developer has met this requirement. 4.2.2 demonstrate the Buyer (Midtown Eco Energy, LLC) has submitted all necessary application materials to the State of Minnesota’s Pollution Control Agency to request issuance of an air quality permit as necessary to build and operate the Project. 4.2.3 demonstrate that Buyer has submitted all necessary application materials to the City of Minneapolis for a conditional use permit to build and operate the Project. 4.2.4 demonstrate that Buyer has financing commitments for debt and equity sufficient to undertake the Project, which commitments may be reasonably conditioned, as well as a commitment to enter in a power purchase agreement subject also to reasonable conditions. The Developer has not met this requirement. It is the staff’s joint professional position that the developer has not sufficiently demonstrated a commitment from a utility provider to enter into a power purchase agreement. The Developer submitted a letter from Xcel Energy dated March 17, 2008 which indicated that Xcel was in negotiations with the developer, but the letter did not indicate a tentative agreement, an agreement in principle or any commitment to enter into an agreement. Additionally, staff was concerned that the letter was written from a mid-level staff person and that such person may not be a person with any authority to speak for Xcel. A certified letter has been sent to the developer addressing the City’s staff position on the issue. We have offered to meet with the developer and others to address this issue. The developer is entitled to provide additional information any time prior to the March 30, 2008 deadline in order to meet the Option Requirements of the Purchase Agreement. Minneapolis officials have told the developer of a proposed wood-burning power plant that it hasn’t met a key condition for buying city land for the project. Midtown Eco Energy was told Wednesday that city officials feel it lacks a commitment from a utility to buy the project’s electricity. That’s required in the option agreement for the land. The move leaves up in the air the developer’s ability to purchase the site at 2850 20th Av. S., now serving as a city garbage-handling station. Midtown said in a statement that it is disappointed by the delay. “We will continue our discussions with the city, and hope the matter is resolved as quickly and judiciously as possible,” the statement said. The option agreement requires Midtown to meet city conditions by Sunday. Midtown earlier asked to extend that option deadline by five months, but withdrew the request and asserted that it had met all option conditions. But the city determined that a letter dated last week from Xcel Energy said only that negotiations were underway to sell the project’s power to Xcel, without any tentative commitment. The city also wants a commitment from a higher-level Xcel official. One thing that’s certain is that the council couldn’t grant an extension by Sunday. That raises the question of whether there’s support on the council for granting a new option. Opinion in neighborhoods around the controversial project appears to have shifted against the project since it moved from the nonprofit Green Institute to for-profit Kandiyohi Development Partners, the politically connected group behind Midtown. Opposition also developed on environmental grounds. Meanwhile, the Minnesota Senate’s omnibus environmental bill would require the project to hire 35 percent of its workforce from nearby, require advanced diesel emission controls on trucks hauling wood to the burner, and mandate quarterly reporting of plant pollutants to neighborhoods. And what’s up with the Senate Omnious Environmental Bill? It says that the Eco-Crapper would be OK if it meets these conditions? or emissions of noise pollution. transportation, processing, or disposal of waste. (5) is located near the junctions of several heavily trafficked state and county highways and two one-way streets which carry both truck and auto traffic. The Pollution Control Agency may revoke or modify any permit issued under this subdivision and section 116.081 whenever it is necessary, in the opinion of the agency, to prevent or abate pollution. (4) refrain from burning refuse-derived fuel, as defined by section 119.90, at the facility. (c) The Pollution Control Agency has the authority for approval over the siting, expansion, or operation of a solid waste facility with regard to environmental issues. However, the agency’s issuance of a permit does not release the permittee from any liability, penalty, or duty imposed by any applicable county ordinances. Nothing in this chapter precludes, or shall be construed to preclude, a county from enforcing land use controls, regulations, and ordinances existing at the time of the permit application and adopted pursuant to sections 366.10 to 366.181, 394.21 to 394.37, or 462.351 to 462.365, with regard to the siting, expansion, or operation of a solid waste facility. Michael Krause has long been promoting a wood-burning power plant in south Minneapolis, and his development idea is known as the Midtown Eco Energy facility. But today, Krause is feeling burned up. So, too, are officials for city of Minneapolis, which owns the 1.6-acre site where the plant would be built, home to a still-in-use garbage transfer station. And the councilmember for the Midtown area, Gary Schiff, doesn’t want to spend any more time on the project. In fact, Krause, a principal with Minneapolis-based Kandiyohi Development Partners, said that his firm is weighing legal action against the city. Kandiyohi has a contract to purchase the city-owned garbage transfer station at 2850 20th Avenue S. for the $92 million project. But the contract requires Kandiyohi to meet a list of option requirements before a looming March 30 deadline. City staffers don’t believe that Kandiyohi has met all of the conditions. Greg Goeke, director of property services for the city’s Department of Public Works, sent a certified letter to the developers on Wednesday, outlining the city’s concern that Kandiyohi has no deal in hand from a utility to buy the power generated at the proposed plant. A separate, internal city memo noted that the city does not believe that Kandiyohi has secured financing for the project. “[The letter] came as a surprise. We clearly think we’ve met all the requirements for the option,” Krause said. In response, Krause said that his firm is considering suing the city. City representatives met with the Kandiyohi team on Thursday to discuss the project’s status. “We are continuing to work and communicate with the developer, but the power purchase agreement requirement hasn’t yet been met,” said Matt Laible, a spokesman for the city. Krause said that Kandiyohi believes it has demonstrated that Xcel Energy is interested in the project. A March 17 letter from Xcel Energy to Kandiyohi acknowledges that the utility is “negotiating the terms of a power purchase agreement” at the site, but makes it clear that there is no definitive agreement yet. Xcel spokeswoman Mary Sandok declined to comment beyond the letter. Councilmember Schiff, who has supported the project in the past, has become frustrated with the protracted project. The Midtown Eco Energy site is in Schiff’s Ninth Ward. Schiff noted that the developers were already granted a one-year extension on the deal to buy the site, an extension that expires on Sunday. A year later, Kandiyohi still does not have a deal. Plans for the long-gestating project date back to 2001, when the nonprofit Green Institute first floated the idea. Krause was then executive director of the Green Institute. He later left the Green Institute and formed the private Kandiyohi, which took over the burner project and bought the Green Institute’s research. 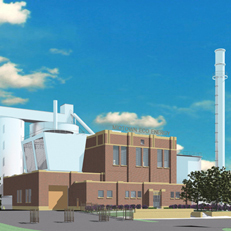 The city of Minneapolis issued an RFP (request for proposals) in the spring of 2006 to sell the transfer station property and develop a biomass plant. The city drew a single response: from Kandiyohi. Kandiyohi’s plan calls for a 24.5-megawatt facility that would generate both electricity and heat. The primary fuel source would be wood, but a past Kandiyohi submission to the city also mentioned agricultural byproducts such as cornstalks and corn cobs. Although the biomass project is touted as eco-friendly, an ad hoc coalition of neighbors, Minneapolis Residents for Clean Air, is organizing against the project. Jullonne Glad, a member of the group, said that neighbors are concerned about the potential environmental impact of the power plant. Krause said that Kandiyohi has been judicious in its environmental review of the project. Two other as-yet unresolved issues for the project are state environmental review and the status of federal production tax credits. The Minnesota Pollution Control Agency (MPCA) is currently reviewing Kandiyohi’s submitted environmental assessment worksheet (EAW) on the project, which developers submitted in January. Kevin Kain, an MPCA project manager, said that the MPCA is waiting for some additional information on air emissions from Kandiyohi. He estimates the proposals will be ready for a public comment period in May. Kain said the comment period should last 45 days, after which the MPCA would review the comments and make its findings. Federal production tax credits, a financing tool widely used by renewable energy developers, are currently set to expire at the end of the year. “It’s become a political football,” Krause said of prospects for extending the tax credits. But those issues are moot if Kandiyohi doesn’t have a site to develop. Nevertheless, the project still has political support. Jeremy Hanson, spokesman for Minneapolis Mayor R.T. Rybak, said Thursday that Rybak remains a supporter of the plan. “Mayor Rybak continues to support the Midtown energy project and thinks it’s going to create a good source of alternative energy to help us address global climate change and will provide great jobs in an area of the city that’s very important,” Hanson said. FYI, I’ve posted the CapX 2020 Information Requests, going back and forth, on www.nocapx2020.info. There’s not a lot there, and more outgoing than responses. They’ll be here, I’ll just keep adding to the page as I get them. When is a letter just a letter? They don’t have a PPA. That’s very clear, though they’re trying to muddy it with “the letter.” I did some checking on my own, made some phone calls, sent some emails, and nope, there’s NO Power Purchase Agreement. What they’ve got is a letter saying there is no commitment! This letter is provided solely as an accommodation to Midtown with respect to the Option Agreement and does not create any obligation on the part of NSP to agree to any terms or conditions of a power purchase agreement, or to enter into a power purchase agreement with Midtown, or to issue or provide any approvals of any proposed power purchase agreement. The developer has exercised its option to buy land for the power plant in the East Phillips neighborhood. Minneapolis officials are poring over a developer’s claim that it has met conditions to exercise an option to buy a city site for a wood-burning power plant in the East Phillips neighborhood. Kandiyohi Development Partners asserted to the city in a letter received Friday that it has the necessary commitment from Xcel Energy to buy the plant’s power, one of the city’s conditions for selling its land. That’s an abrupt change of stance in a week. Kandiyohi earlier asked the city to extend its March 30 deadline for exercising the option. Kandiyohi’s chances appear to hinge on whether it has “a commitment to enter into a power purchase agreement” subject to reasonable conditions, as required by the option agreement. “By no means is it an ironclad agreement,” said burner opponent Jullonne Glad. In a letter last week, Xcel acknowledged that it is negotiating with Kandiyohi. But the utility’s commitment contains a big if — if the developer and the utility reach an agreement. If so, Xcel said it will seek necessary management and regulatory approvals. “We are negotiating with them,” said Xcel spokeswoman Mary Sandok. Greg Goeke, who is managing the land sale for the city, said city officials will decide “in a day or two” whether the developer has met option conditions. Kandiyohi tried last July to exercise the option, but the city said it hadn’t made enough progress on the power sales agreement. Kandiyohi said in the letter that it has exercised its option, sending the city a $50,000 check due. If the city agrees that Midtown has met all option conditions, it still must meet stiffer conditions to close on the land by the Oct. 2 deadline. By then, the option agreement requires that Kandiyohi have all necessary government approvals, including a state emissions permit; demonstrate financing commitments, which it has obtained from Piper Jaffray; negotiate a neighborhood agreement, and have a signed power sales agreement. Quam, 46, talked recently about her new job spearheading environmental and health care investments at Piper Jaffray while evading questions on her political ambitions. Wonder if she recognizes the environmental harm of burning, the environmental harm of the Midtown Eco-Crapper — and that burning doesn’t do a thing for CO2, other than generate more!